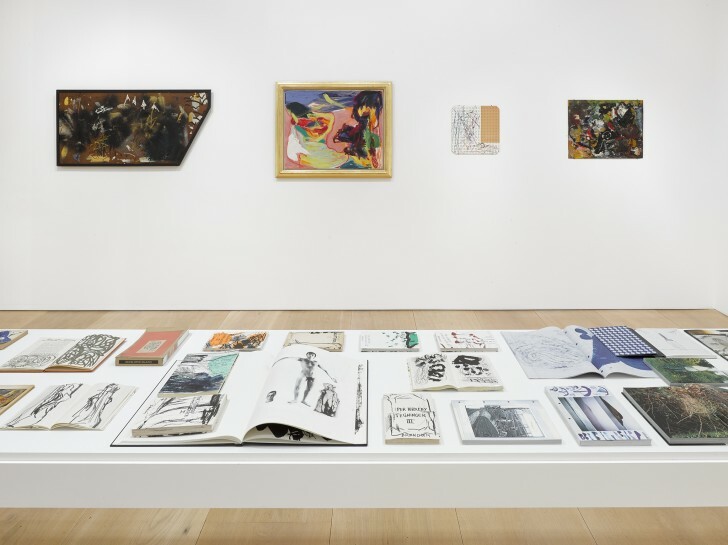 On the opening of a new exhibition at Victoria Miro Mayfair celebrating three generations of internationally-acclaimed Danish artists – Asger Jorn (1914–1973), Per Kirkeby (1938–2018), and Tal R (born 1967) – Tal R discusses the what unites them and how painting collapses time. Did you know Per Kirkeby well? I got to know him about twenty years ago. I liked him a lot. And through him, and also because I was teaching in Dusseldorf, I got to know Jörg Immendorff and Georg Baselitz. I took over AR Penck’s class, I know Markus Lüpertz well – he was mine and Peter Doig’s director, so I feel very much connected to the whole group. I think I was the only one at art school in the ’90s who was interested in these people, because they were out of fashion. But I felt I really learned something from all of them. And Per also brought part of that German attitude to Denmark. So, in many different ways I was influenced by all of this. Some of the Kirkeby works in the Mayfair exhibition are surprising, almost like Pop Art? It’s very Per Pop from the 1960s and ’70s. The only access you had to the American painters at that time was in magazines or in travelling exhibitions. Today everything is different, everything hits the fan at the same time. Maybe Per went to New York but he would have been a tourist there. Originally he was a geologist, and that’s something you can read through all of his work, especially the very early and very late paintings, where the work is all layers, sedimentary layers. He went on all these expeditions to Greenland and to South America but he was travelling as a scientist. So, in terms of Pop Art it’s like suburban Pop. It’s like you’re sitting in Denmark, you are in the countryside and you want to be a Pop artist. Is Asger Jorn someone you looked at from the beginning. Is he a hero? Again, with Jorn it’s about suburbia. With Jorn, especially in the 1960s and ’70s, there was something about him. He smelled of the rest of Europe, of ‘South’ – of the big world outside. And he was really the only artist who had some kind of career outside of Denmark. There were others who would maybe have a show in Paris but not like Jorn, because he was really travelling all the time, meeting all these different people. How did that affect his work? I think what’s important is that Jorn had a method. Very early on he was painting but he was also saying that the education, what you learn from painting, you put into other stuff – you make books, you write, you make sculptures, you do lectures. Jorn also collected art. He was a generous character. He collected stuff, brought it to Denmark and that changed the next generation. He was a catalyst. How did his example influence subsequent generations of Danish artists? You could say that kind of collage approach was something that Per learned a lot from. When I say collage, I don’t mean working with collage, I mean the idea of cutting, putting together stuff, taking experience out of a painting and putting it in other places, then taking that experience and putting it back into painting. That is a specific way of working. Per also understood from very early on that it was about a method. what I learned from Per, and what he learned from Jorn, what he studied from Jorn, is method. I’m not saying that it belongs only to us but it unites us. Define what you mean by method? I mean a method, really, about being a painter but also being somebody watching the paintings and pulling information and strategies and ideas out of that and putting these into other places. What was special about Per’s method was that, if you want to make paintings and you say, my paintings are just about colours and things that I’ve seen, or whatever, it’s quite easy to make paintings but if you say painting is about painting but it’s also about something that has nothing to do with painting – for instance, geology – this is like mixing water and oil. You can’t mix it, you have to create a bridge, or an even better word than bridge is you have to create a method. ‘Painting has a different clock. What do you think we can learn from Kirkeby? Per was an intellectual. You think, when you start to develop as a painter, you want to develop very freely but actually you only become free when there is something working against you. I taught at Dusseldorf for nine years and I know that the worst thing you can tell a student is to go to the white canvas and do whatever you like. Do that and you’re going to be so not free. And Per had all this other information and interest. He also was the first one that openly spoke about having the projector in his studio. He’d do something and then he’d get out the overhead projector and project one of the Old Masters and just take out a detail, whatever he liked, so there are all these layers of information that go into the painting. Sometimes they end up in this foggy corner. The paintings are not reaching out for you. It’s all nervous dust and fog. Peter Schjeldahl said that Per is a painter for adults, and that’s very accurate. Jorn died quite young, but he was interesting all the way. He moved in so many different directions, he was so active in different scenes. You can also say about Jorn that there was something unfulfilled about him, something you could also say, for example, about Picabia. That’s the beauty of them, that they always stayed a bit behind the frontline. And that’s why artists always learn from them, because they open things up. He’s different. Per, in his very introverted way, went beyond that. He crossed that boundary and made those grand works. But, while many people have tried to do this sensitive, painterly landscape, there’s nothing disturbing in their work. With Per, there’s something that doesn’t fit, all these different things that he insists on, that makes for more introverted paintings. How does the idea of method manifest itself in your work? In my painting, you never see any traces of Per, but I owe him so much because I studied the method. I studied the idea that great art comes from things to do with art and things that have nothing to do with art. And you have to find a method to connect them. That means, the so-called ‘not art’ will really confront the art because it doesn’t want to fit. It just doesn’t. But if you manage to do that you get something that breaks the rules of plain aesthetics. If you just want to study aesthetics you can write a book that tells you about 299 ways of using a brush. But that’s a dead end. There are some very recent paintings by you in the exhibition. What do you think, seeing works made in the past few months alongside a Jorn, for example, made in the 1940s? I was thinking, this is 2019, I am a contemporary painter, and it looks like there are five minutes between these paintings. That could be a criticism but I actually think it is no bad thing. Painting has a different clock. Two hundred years is five minutes ago, and whenever you develop as a painter you go through the same ideas that Cézanne went through when he looked at nature. I think we should talk about this like it’s an interesting thing, like it’s a great thing.